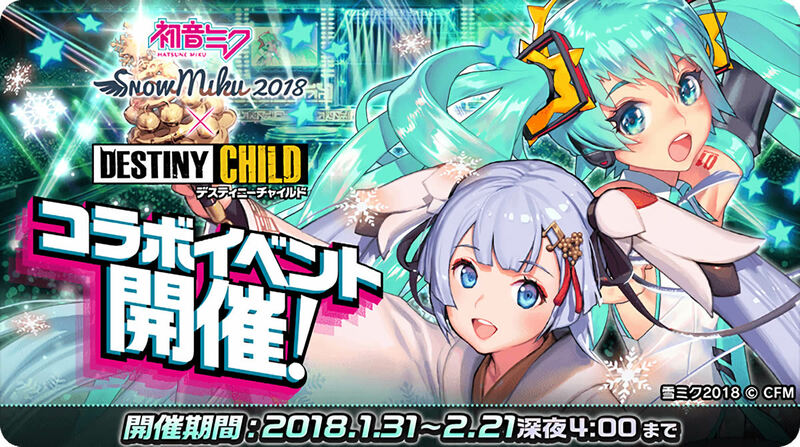 Great news for Hatsune Miku fans that also happen to be playing the Japanese version of the Destiny Child mobile game: The Hatsune Miku and Snow Miku 2018 limited collaboration event has begun today! In short, Destiny Child is a free-to-play turn-based mobile RPG, with the plotline of Lucifer taking over the world, and you’re a low-level demon building an army to stop him. In this collaboration, both Hatsune Miku and Snow Miku will be summonable as 5-star rank support characters, boosting your team’s attack or healing properties. The collaboration is scheduled to run from January 31st until February 28th, with a 3X higher summoning rate between January 31st and February 14th. The collaboration is available only on the Japanese version of the game, and can be downloaded from the Japanese iOS store, or from the Google Play Store with a Japan-based connection.